Jordan Burnham, from Active Minds’ Speakers Bureau, tells new students about his depression and suicide attempt. 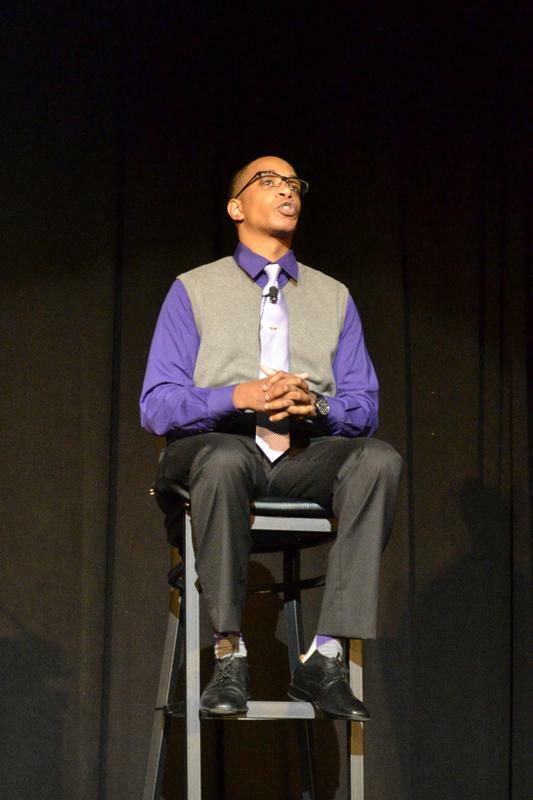 He urged students on Sunday night to continue a conversation on mental health. After an academic year that brought mental health issues at Northwestern to the forefront of campus discussions, a new required event for freshmen and transfers debuted Sunday night at Welsh-Ryan Arena. The latest addition to the series of Essential NU events presented to incoming students included talks from John Dunkle, director of Counseling and Psychological Services; Patricia Telles-Irvin, vice president for student affairs; and Ani Ajith, Associated Student Government president. Jordan Burnham, a member of Active Minds’ Speakers Bureau, gave the program’s featured speech. Burnham spoke of how his struggle with depression fueled his attempt to take his own life. He stressed that being able to talk about psychological problems is key to taking care of oneself and emphasized that such discussion is important for all issues on the mental health spectrum, from sadness and stress to depression and disorders. Burnham said he hopes his story will inspire students to continue the conversation and encourage them to make mental health a topic of conversation at NU. Following Burnham’s speech, Dunkle outlined University organizations that offer mental health resources, including CAPS, the Women’s Center, the Dean of Students’ Office, Sexual Health and Assault Peer Educators and NUhelp. “If there’s one clear message that we want you to leave with, it is that it is OK to ask for help,” Dunkle said. Ajith echoed that sentiment, saying the senior class has succeeded at NU by learning to recognize their limits and care for each other. He added that recognizing one’s limits means realizing that the mind can veer off the beaten path and that students should feel open talking about their problems. Returning peer adviser Maria Rozo said the program’s focus on the message “it’s OK to get help” was important. Patricia Hilkert, director of new student and family programs, said the addition of mental health programming to Wildcat Welcome is an attempt to make students aware of the resources available to them and the ways the University can help them before the issues become too serious. Telles-Irvin noted that student support for the programming was crucial to its inception. “It was actually our students that came to us, your upper-class colleagues and peers that said to us, ‘We really need an ENU on mental health,’ and, because the students came to us with that request, we decided it would be a good idea,” she said. Hilkert said although last year’s tragedies — including two student suicides — brought increased attention to the issue of mental health, the ENU has been in the works for several years. Through the new program, she said, the University is trying to help students understand that mental health issues are not a cause for shame. She explained that because administrators believe the issue is particularly important, it is being addressed through required programming.